The willingness of investors to pursue and acquire quality bloodstock never ceases to amaze. The recent Inglis Easter Yearling Sale, a resounding success, demonstrates the regard in which the best Australasian bloodstock is held, not just by domestic participants, but, most significantly, by some of the most influential international players. Any Australasian breeder would surely be forgiven for affording themselves a wry smile at the prospect of some of the bloodstock world’s most famous names such as The Niarchos Family, Roy & Gretchen Jackson, The China Horse Club and Barbara Banke’s Stonestreet to name but a few, establishing a racing presence in Australia for the first time, or expanding upon foundations laid by initial investments in recent years. 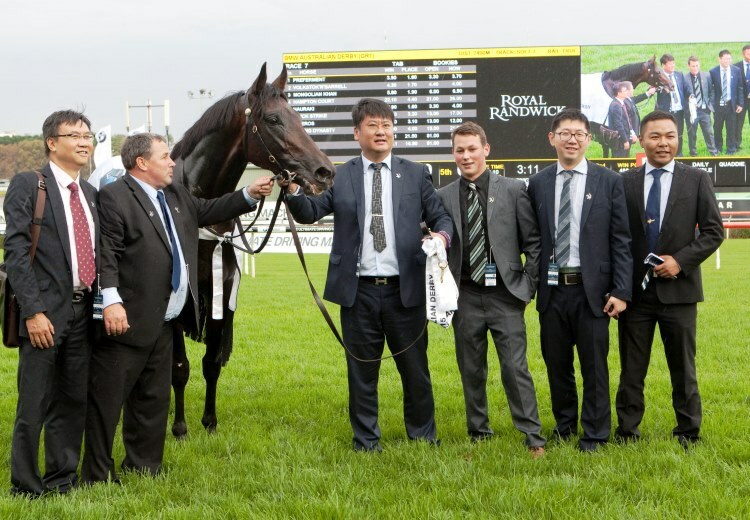 There can be few stronger endorsements of the efforts of the Australasian thoroughbred breeding public than the fact that these international powerhouses want to buy and race Australasian bloodstock. Encouraging too is the capacity of the sport here to attract new participants who are no doubt captivated by the thrill of the spectacle that racing presents here. The Inner Mongolia Rider Horse Industry is one such example. They enjoyed a terrific result winning the Gr.1 Australian Derby on Day 1 of ‘The Championships’ with their irrepressible Holy Roman Emperor colt Mongolian Khan (pictured) and proceeded to purchase a couple of yearlings at the sale over the next couple of days. The patronage and enthusiasm of these sorts of investors goes a long way to generating a real ‘feel-good’ factor around the industry. Hindsight is a wonderful thing and it is only with retrospect that one can recognise what a fantastic occasion this year’s Easter Yearling Sale was. As is the case as a vendor at any sale, the primary focus is on ensuring that your offerings are given every opportunity to attain the best prices, so while you’re conscious of the ‘buzz’ of the sale, you don’t really get to enjoy it. That said, there is great satisfaction in a successful sale and in fairness to the team at the farm who prepared the yearlings for sale, they went to Sydney in very good condition and sold accordingly. Each of our yearlings offered was ‘sold’ and means that of the 78 yearlings offered under the Coolmore Australia banner in 2015, 76 have been ‘sold’. The success of graduates of the farm – our ‘raised and grazed’ – is a testament to the effectiveness of the systems in place on the farm. The management team of the farm has the objective each year of ensuring everything is done to ensure that young stock realise their potential on the racecourse. Vancouver and Pride Of Dubai, who between them have taken out 3 Gr.1 two year-old races this season, are fantastic ambassadors for Coolmore Australia and the work done by the team on the farm. As is the fact that of the 2011 foal crop who make-up our ‘raised and/or sold’ list, there are over 80 individual winners including a number of top-liners (Hi World, Petrology & Winx spring readily to mind!). The positive perception of Fastnet Rock, amongst both domestic and international participants is borne out very effectively by the Easter Sale. 47 of his yearlings sold through session one contributed to 22% of the gross of that session. Overall, the 88 yearlings sold through the whole sale by Fastnet Rock and his 3 sons represented, contributed a remarkable 26% of the gross of the whole sale. His 2015 offering represented the 8th crop of Fastnet Rock yearlings to pass through Easter and tracing back through the records show that he never fails to disappoint at the sale. Each and every year, top-class progeny of his graduate from this sale and I don’t expect the 2015 graduates to be any different. The Candlelight filly (pictured above), bred by John Camilleri and offered by Segenhoe, is a filly that has always looked a bit special. She was born at Coolmore and Peter O’Brien has always maintained that she is an exceptional filly. To his credit, the market agreed and her $1.75m price tag was a fantastic result for John and for Segenhoe. She’ll be broken in at Coolmore before going in to full-work and maybe she’ll be another Atlantic Jewel! Easter can always be a difficult sale for the progeny of first crop sires, given they are forced to compete with many of the best conformed and best bred yearlings by the leading sires in Australasia. However, it was hard not to be happy with how the first progeny of So You Think sold. He’s set to have multiple two year-olds in the care of many of the country’s best trainers next season and the reports from the breakers at this early stage are most encouraging. While I am the first to acknowledge the rose-tinted perspective of a stallion master spruiking the reports of the progeny of a first crop stallion from the breakers, a particularly promising report was delivered recently on the So You Think – Pontiana colt, bred and set to be raced by Lindsay Maxsted and his partners with Team Hawkes. Apparently his riders say that he feels like he is ‘floating’ when moving in his faster paces, which in my book can only be construed as a positive! I can hear Wayne Hawkes licking his lips from here! While it would be unrealistic to expect all of his progeny to be precocious, it wouldn’t surprise were there to be some fast, sprinting performers in his first crop, given the size and strength of hind-part that a number of his yearlings have. He certainly didn’t lack speed himself as has been well documented. Maybe the So You Think – Crevette colt (pictured above), bred by Mrs Remond and offered for sale by Senga Bissett will prove to be one of the sharper sorts. He was a real ‘talking horse’ at the sale and will race for a syndicate of Coolmore partners with Chris Waller. He’s looked every inch the real deal since arriving back here on the farm, that’s for sure. One topic which did seem to frequently raise its head over the course of the Easter sale was the daily start time. As a vendor, the volume of pre-sale inspections on the morning of a sale such as Easter are often low. Prospective purchasers, vets, agents and trainers invariably have their work for the sale day completed well in advance and the 11am start tends to result in the majority of participants left waiting idly for the start of the sale. Certainly the majority of people I spoke to felt that an earlier start time would be unanimously well received. Credit must be given to the team at Inglis, not only for the strength of the buying bench assembled, but also for their willingness to make efforts to enhance the sale day experience for the all-important purchasers. The creation of the ringside dining area looked to be a good initiative which added an extra dimension to the sale. Speaking of dining, hasn’t Coogee progressed impressively in 12 months?! Little Jack Horner is certainly a welcome addition to the list of eateries in the area and you didn’t miss too many people if you chose to have your end of day drink in the Pavilion at Coogee – a most welcome development! As I write (and it’s taken me a few days to pen all of this), I’ve been lucky enough to become a father again, with my wife Julie giving birth to a baby girl – Alexandra Elizabeth – on last Monday week. A proud and fantastic moment for our family! I had thought that the last few months had been busy, but it looks as though things are about to get a whole lot busier!